In response to the Democrat effort to undermine the American Electoral College, some electors are fighting back. They’re showing the side they’re on. And they’re doing it by singing while they march. And note what they have on their sign: “Thank You President Elect Donald J. Trump – Make America Great Again” – Wow! 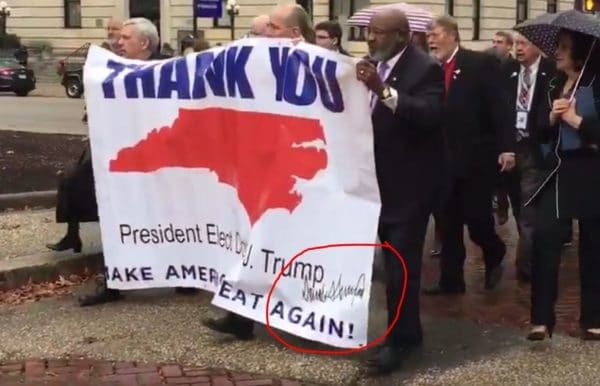 Is that Trump’s signature on the sign? To her, we say: 62 million Americans already did. 62 million Americans already voted their conscience. We voted for Donald J. Trump. To try to undermine that by browbeating electors, Democrats aren’t just undemocratic. Donald Trump will be the next President of the United States!